When I bought my unlocked Galaxy Nexus, I figured that I’d simply use the SIM card in my iPhone 4S with the handset. Instead, I pulled the T-Mobile SIM out of my Samsung Galaxy Tab. I’m glad I did because I discovered a very appealing scenario. By using the data-only SIM — which costs me $40.00 per month for unlimited texts and data — with a new Android 4.0(s goog) feature, I’ve turned the Galaxy Nexus into a VoIP phone: I can get or receive calls solely through Wi-Fi and mobile broadband networks without subscribing to a voice plan. Google’s newest mobile operating system version, known as Ice Cream Sandwich, natively supports SIP accounts in the Phone dialer app. This addition of SIP support opens up a whole new world of voice possibilities. SIP, which stands for Session Initiated Protocol, unifies both voice and video over standard IP-based networks. As voice becomes data — especially in the future as LTE networks are IP-based — this means we’ll have more flexibility and features over traditional voice calls and even phone numbers. Let me step back for one second to clarify something: SIP support on smartphones isn’t new, nor did Google “invent” anything here. I recall that some Nokia(s nok) devices a few years back included native SIP support in both the Symbian and Maemo platforms. In addition, there are a number of third-party SIP-based VoIP apps available for both iOS and Android. Google has simply integrated SIP support into the platform. Having said that, I’m glad they did. As I was using the Nexus all weekend long (see my first video impressions here), I was still carrying my iPhone 4S, which has my primary phone number. 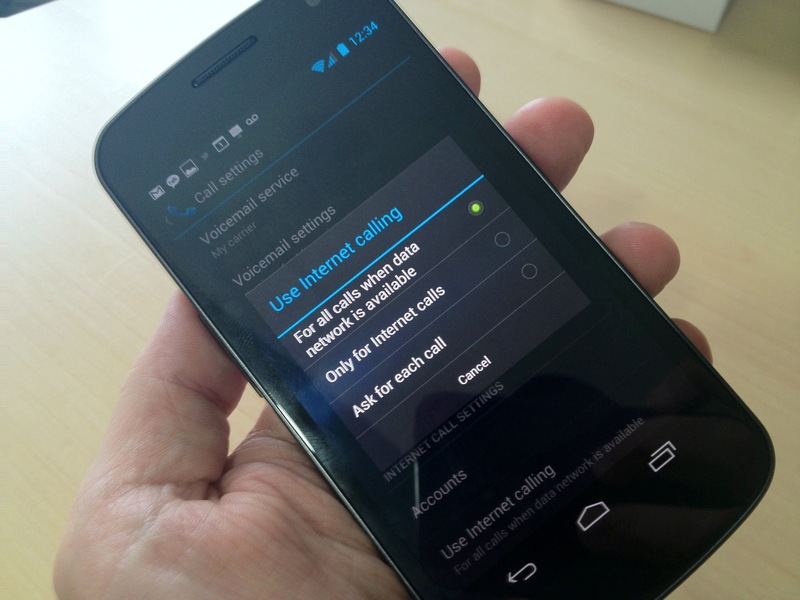 Finding the SIP support and configuration options within the Android 4.0 Phone settings got me thinking more about VoIP. It also didn’t hurt that in my local area, I’m seeing nearly 10 Mbps download speeds on T-Mobile’s HSPA+ network. Standard voice calls use far less bandwidth — around 12 Kbps — while even new wideband audio codecs used for higher quality sound top out around 64 Kbps. So, VoIP over Wi-Fi and 3G ought to be just fine for the most part and shouldn’t do too much damage to a capped data plan. There are a number of VoIP companies that support SIP, so I did some research over the weekend and settled on Callcentric for now. There was no charge to get a SIP account, which enabled VoIP to VoIP calls on my Galaxy Nexus after I configured the Phone app. Taking things one step further, I signed up with Callcentric to provide me a local phone number for $2.95 per month. With that, I can receive incoming phone calls at no charge: These can originate from any phone — mobile or landline — just like a traditional call. But while the phone may start on a cell network or old copper line, it gets routed as data to my handset. That’s all well and good, but to be honest, I don’t want to give my contacts yet another number. Enter Google Voice, which uses the customized phone number I hand out to everyone. I added my Callcentric phone number to Google Voice and now all incoming calls to my main number ring my Galaxy Nexus at no charge. They also ring all of my other phones, making for a jarring experience when I actually get a call! So now I have free incoming calls coming to the Nexus and its data-only SIM card. I tested a 20 minute Wi-Fi call with Andy Abramson, a VoIP guru, and the call quality was superb. Testing calls over HSPA+ to my son were also great, but of course, will vary based on coverage and other factors. But if I stopped there, I would only be able to make outbound calls to other SIP users. Again, Callcentric had a solution. While it sells unlimited voice plans for $19.99 a month, I make few outbound calls, so I opted for the no monthly charge, pay as you go calling plan. By adding a minimum $5 credit to my Callcentric account, I can now make calls to any phone — a landline or a cellular phone — from my Nexus over the data line. The cost for calling in the U.S.? $0.019 per minute. Given my limited outbound calling, that $5 ought to last me several months. There are a number of ways to get all of this working, but this was my first effort and I’m generally happy so far. The only downside right now is that outgoing calls show my Callcentric phone number on the recipient’s phone and I’d rather have my Google Voice number appear. Some third-party SIP clients and services allow for number “spoofing” to make this happen, so I may yet change my setup. Ideally, I’d like to see Google add both SIP support and number spoofing to Google Voice. Again, I had planned to switch my AT&T SIM between the Nexus and iPhone 4S, but I think this solution is better. I don’t need to swap SIMs and incoming calls will ring both phones. The data-only SIM without a voice calling plan requirement is about half the cost of a traditional voice and data plan, even with the $2.50 a month I’m paying for the Callcentric phone number. And my Samsung Galaxy Tab — which is effectively a Wi-Fi tablet — can still be taken everywhere because its SIM card can be used with the portable hotspot feature of the Galaxy Nexus. It’s a win all around for me. My deeper dive into SIP and mobile VoIP is far from over, though. I’ll continue to look at alternative options and third-party clients. My next step is a chat with the folks at Counterpath, which offers Bria, a VoIP/SIP client, for both iPhone/iPad(s aapl) and Android devices. I’ll share the results of that discussion in a follow-on post within the next day or two. In the meantime, I’ll be enjoying voice calls on my data-centric Galaxy Nexus! Galaxy Nexus + data plan + VoIP support = freeÂ calls! http://t.co/cz4Zspm9 For those who asked for the deets on my no-voice plan Nexus.